Whilst you are trying to figure out how to use WordPress, the settings section might be a little confusing at first. It’s really important to look at these and set them correctly, as they affect a lot of how your site looks and acts. So lets check them out. As it says, general options, but important ones. Site title: If you haven’t got an image replacing this, then What you type here will come up as your site ‘logo’. So make sure it sounds good and is spelt right! Tagline: A description of your site, normally just a few words. Not always shown, theme dependant. WordPress Address & Site Address: There should be no need to change these, but if you have WordPress installed in a different directory than the root directory you need to let WordPress know. Email address: Self explanatory really. Membership: This should not be ticked unless you want people to be able to register as a user of your site. Most of the time Internet Marketers don’t want this turned on. New User Default Role: Should be left at Subscriber unless you have a specific reason otherwise. Timezone: Whilst self explanatory, it is best to set this correctly as its set to GMT (UK time) as standard. Date & Time Format & Week Starts On: Self explanatory. Here are all the settings for writing and publishing posts. Size of the post box: Should be no need to change this unless you are using an older Internet Explorer (upgrade!) and like a bigger space to write in. On modern browsers at the bottom right of the post box is a little tab you can resize it with. Formatting: The standard settings should be fine, I’ve never had an issue with the XHTML, but it may be worth testing if you have a theme issue. Default Post Category: Sets what category will automatically come up when you write a post. Defualt Post Format: Displays the themes post formats (so will differ from theme to theme) and these are different styles posts can have, such as no sidebar etc. Defualt Link Category: Same as the Post Category but for your links (blogroll)! Press This: Another mention of the Press This Bookmarklet, should you wish to use it. Post By Mail: An interesting system, but one Internet Marketers may seldom if ever use. It allows you to submit posts by mail, but then you would need to style them, add images etc. If you have internet access to mail, you might as well log in and do it. Remote Publishing: Similar to Post by Email but from desktop software. In this day and age it seems somewhat pointless, but if you prefer to you can set it up here. 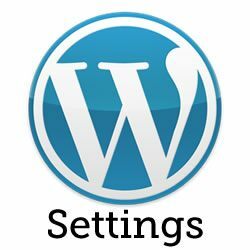 Front Page Displays: WordPress started life as a blog, so its initial setting is a blog style where your latest posts show on the home page. If you don’t want that and you want a specific page (with static or particular content on) displayed as you home page, create the page and then select it here. If you’re having a blog style page too don’t forget to put that in under the Posts Page bit. Blog pages show at Most: Pretty easy, the number of posts shown on one page. WordPress with paginate (posh word to mean put a next page link in) automatically. Syndication Feeds…: Same as above but for RSS feeds (and without the pagination). For Each Article in a Feed: Determines whether your RSS followers see the whole post of just an excerpt. Excerpt is usually better, especially if you tend to waffle like I do. Encoding: Unless you need a particular character set for a non English language, leave this set at UTF-8. These settings are all about your comments. Now, whether you are planning on allowing comments or not you need to check these settings to either stop comments or tweak them to your liking. Attempt to notify any blogs linked to from the article: Basically this means you will ‘ping’ any site you link to, telling them that you have linked to them. If they have a system in place they may log that ping as a comment – Free Backlink! So always have this on. Allow link notifications from other blogs (pingbacks and trackbacks): Same as a above but for links about your site. Useful to have on as you can see some of the incoming links to your site. Allow people to post comments on new articles: Once selected any new posts will have comments blocked. This does not work on any posts published prior to you selecting this, so you will have to change them manually, so decide if you want comments before you start writing all your articles. Comment author must fill out name and e-mail: Forces a visitor commenting to fill out these details. Recommended, as it may help reduce a tiny bit of spam. Users must be registered and logged in to comment: If you are allowing comments this is usually not recommended unless you have a private membership site, in which case it is. Also if you are not using comments, selecting this helps block them on any previous articles that you haven’t stopped comments on. Automatically close comments on articles older than days: If you don’t want old content to be revitalized by random new comments months, years down the line, set this. Break comments into pages… : This ‘paginates’ the comments, so if you have a lot they spread over separate pages (think Amazon here, they do the same). Also you can decide which page is displayed first and if the new or old comments should be at the top. E-mail me whenever: Pretty straight forward, you will get emails sent to the email address you provided (check Users > Your Profile if you are unsure which email. Before a comment appears: Again fairly straight forward, you either have to approve all comments, or once you approve one the rest from that user (by email address) are allowed through automatically. If you don’t select either, all comments are added with no moderation. Manages all the setting for images, videos and uploads. When you upload/insert an image into a post, WordPress actually saves 4 copies: the original size, a thumbnail (really small), medium and a large size, depending upon the original image size of course. Here you can tweak the image sizes to perfection so that they look exactly as you want them to in your articles. The automatic settings are normally fine here. The Embed from a URL is a good thing, it can save some bandwidth on your site as it will load the videos from YouTube etc directly. You can also change the size of the video here. It is recommended only to have one size set (height or width) as otherwise the video may get squashed or stretched. Here you can change the organizational structure of your uploads, should you wish to. Really simple options here, but really, really important! You should always have “Allow search engines to index this site.” otherwise search engines can ignore your site, which as an Internet Marketer is problematic to say the least. Permalinks are just a fancy name for the links/urls to your article posts and pages. The WordPress default permalinks are pretty ugly and meaningless to visitors: www.apinapress.com/?p=123. See, no idea what page or post that refers to… These can and should be changed, and its really easy to do so, simply select one of the predefined settings. I personally think Post Name is the best for SEO purposes, though I’m sure others may disagree. You can also change the permalink structure to a custom structure should you wish to, check here for the structure on how to do it. If that isn’t enough customization for you, you can even change how the Categories and Tags are displayed in the URL as well. It’s unlikely you will need to use this unless you have a very complicated category and tag structure going on. So that’s the WordPress Dashboard Guide finished. If you have followed it from the start you now have (hopefully) a good understanding of all the WordPress dashboard links and what you can do with them. Feel free to share these articles with anyone who needs to understand better, within or without of the Internet Marketing community!